Peak HiFi helped Aleksander a customer of ours in Norway assemble his dream supercharged Garrard 401 by supplying him a custom made brass platter and the well regarded SMD upgrade bearing. Aleksander commented "thanks for your great service and for making my Garrard a masterpiece in sound." Garrard 401 has brass platter and stainless steel bearing from Peak HiFi. idler wheel from Artisan Fidelity and PSU from Loricraft. Tonearms are Origin Live Conqueror MKIII 12 inch and Reed 3P 9 inch. TW Acoustic Raven Two with TriPlanar and Kuzma 4Point 11inch and Vdh Colibri XGW and Miyajima Zero mono cart with Miyajima mono step-up transformer. AirTight 211 monos for the horns and two Parasound A21 for the basstowers. 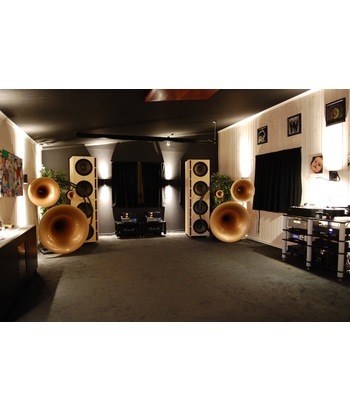 Avantgarde Acoustics Trio Omega and custom basstowers from BD Design in the Netherlands.